Investigate the crash site. The marker’s sitting on my map, far to the northeast of a planet called “Elaaden,” across sand dunes and past ancient ruins. It sounds important, maybe—the type of small-scale situation that, in any other game, might be the first loose thread of a tangled, thrilling adventure. And so finally I obliged—me, the Pathfinder, one of the highest-ranking people in the Andromeda galaxy. I took time from my war against a race of genocidal aliens to investigate the crash site. There were three survivors amidst wreckage I could swear I’d seen duplicated on another planet earlier. Three of them—but within seconds another ship lands, this one full of hostiles. I kill them. The people I saved thank me, briefly. That’s it. The quest pops up, green for “Completed.” Dopamine shoots into my brain. Nothing ever comes of it. Nobody ever mentions this task again. The world doesn’t care, and neither do I.
There’s a literal galaxy of potential here. 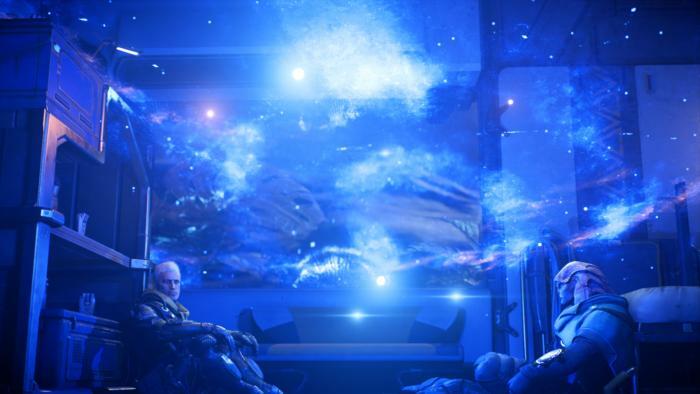 Andromeda’s conceit is that as the Reaper threat closed in on the Milky Way in the original Mass Effect trilogy, a group of intrepid explorers undertook a 600-year journey to the neighboring Andromeda galaxy—a totally unknown expanse, though there was the promise of certain “Golden Worlds” which seemed worthy of settlement. 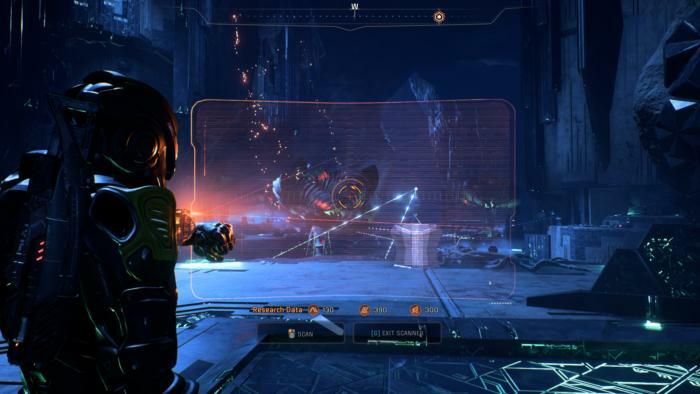 In a Mass Effect: Andromeda preview a few months back I warned that it felt dangerously similar to Dragon Age: Inquisition’s worst aspects. What I failed to gauge was that Andromeda is, in many ways, more insidious in its disregard for your time. Inquisition didn’t hide its flaws. It leaned into them. “Go mark these ten supply crates” or “Go close these rifts”—nobody would mistake these quests for something of substance. It’s the generic MMO treadmill we’ve lived with for decades. Which doesn’t mean I forgive Inquisition its flaws. Quite the contrary—my opinion of that game has only gone down the more distant it’s become, especially in a post-Witcher 3 world. But Inquisition’s padding was obvious, like a slimy mold on top of a once-good sandwich. Andromeda is subtler, like an apple rotted from the inside. Andromeda gives you missions that sound important and couches everything in an air of undeserved gravitas. Oh sure, it’s easy to avoid the “Scan 16 minerals” mission—that one’s obvious. But a mission that tells you to learn about the laws and ethics of a newly discovered alien race? Or one that asks you to stop the proliferation of an addictive drug through one of your colonies? It cuts twice as deep when these seemingly important missions turn out to be as pointless as the rest, as shallow as mineral scanning but given just enough lampshading to make you think it might be worth your time. Take that “Addictive Drug” quest I mentioned above. 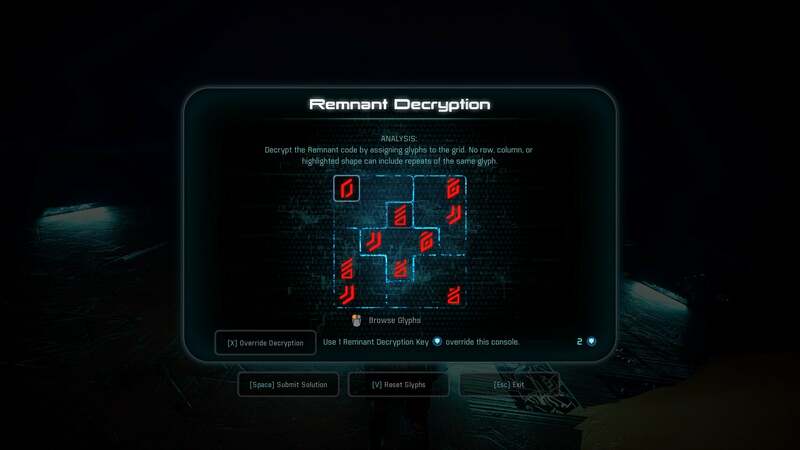 You’re sent to the same type of seedy, lawless town BioWare seems to include in every game. Once there, a doctor in the slums says he created a miracle drug, but it’s been co-opted by the local crime gang and used to turn people into junkies. He wants you to shut down the operation and get back his formula. You have two options, here. You can believe her, walk away, and the drug continues to be abused. Not great. Or you can kill her and give the formula back to the doctor on the off chance this new person might be lying. That’s not really much of a choice there, so I killed her and took the formula back. The quest ends. No last-minute twist, no actual moral quandary here. Everything is exactly as it seems. 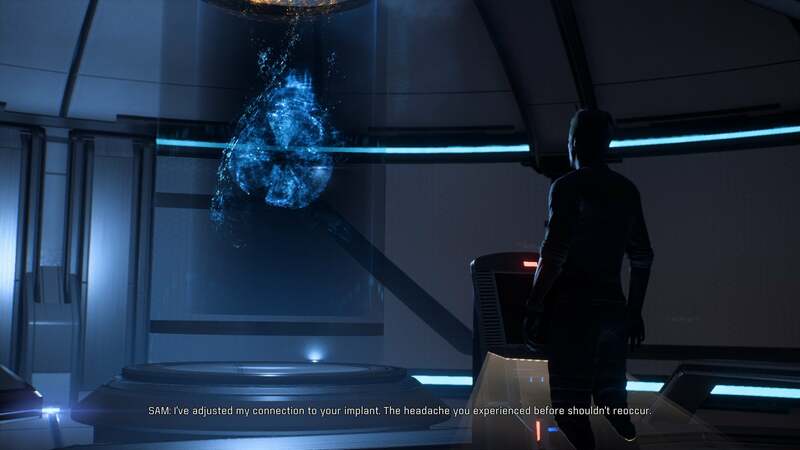 And this happens all the time in Andromeda. So many times you think a mission might escalate into something interesting, only for it to fall into the most hackneyed, “Actually nothing untoward was happening” resolution. The signal to noise ratio here is about the same as Inquisition: 15 hours of solid story content, 40 hours of filler. But you certainly wouldn’t know the ratio was that bad by looking through your journal. Yeah, you can write off all the stuff in the Tasks section pretty much immediately—it’s mostly padding. The rest, though? Too many times I bit into the apple and was rewarded with soggy gray mush. And notice the label I’m willing to give that core content is “solid.” The critical path missions suffer from the same problem in most cases: Every so-called plot twist is telegraphed so hard that by the time it actually happens you’ve anticipated it for at least an entire mission, if not more. Not your characters, though. They’ll persist in yelling stuff like “What’s going on here?” and “I just don’t understand what’s happening with [BLANK]” for half an hour while you grit your teeth, the outcome readily apparent as you march slowly towards the end of the mission and the inevitable grand plot unveiling. It’s just...not great. Again, an entire galaxy of potential and most of it squandered. Planets are sci-fi stereotypes—“Ice Planet,” “Desert Planet,” “Oversized Mushroom Planet.” You make first contact with two new types of aliens, one of which immediately shoots at you, the other which seems like it can’t understand English (interesting!) for about two minutes before Important Character shows up and speaks English anyway (not interesting). You arrive in Andromeda to find those who came before on the verge of starvation, but ten minutes later the space station is just a neo-Citadel. All of Mass Effect’s most creative aliens—the Elcor, Hanar, Geth, and Quarians—are entirely absent. There are a few weighty moments, particularly in the last few missions—ones that could be built upon in a sequel. But even these moments are somewhat squandered, with many of them cropping back up as side missions too. Reusing the same nifty idea six times over doesn’t make the cool thing better, it just makes it more pedestrian with each repetition. Loyalty missions are the sole exception, with each taking place in a semi-unique environment and featuring some of the strongest writing in the game. The problem there is that, well, none of the companions are that interesting. Peebee, Jaal, and maybe Drack are serviceable, but I found the other three incredibly boring cardboard cutouts. It doesn’t help so many are obvious stand-ins for companions from the original trilogy—if they referred to Drack as Wrex I’m not sure I’d even bat an eye. Moving beyond story for a moment, there’s a whole ouroboros of awful systems. Crafting, for instance, is entirely redundant since the game is more than willing to either give or sell you guns at every turn. But say you just have to have a certain kit: You’ll need to first collect research points by scanning random objects, then turn those points into blueprints, then collect metals and other resources to actually create the object. Even better, SAM’s priority in the voice-acting queue is higher than anything else. Accidentally drove through a mining zone while one of your companions was detailing important quest information? Too bad. That key info’s gone, because SAM needs to tell you to break out the space drill. It’s almost too perfect a summation of Andromeda’s issues. I can’t help feeling the industry has left BioWare behind, though. I’ve heard Andromeda’s defenders say BioWare’s older games, including the original Mass Effect trilogy, had these problems too. And they’re right to some extent—though I still think the original trilogy and Knights of the Old Republic were better-written moment-to-moment. But there’s also a certain leeway given when you’re the only studio providing an experience. BioWare used to be one of the few that paid lip service to storytelling in an industry that treated it as an afterthought. A universe affected by your choices meant something in 2007. 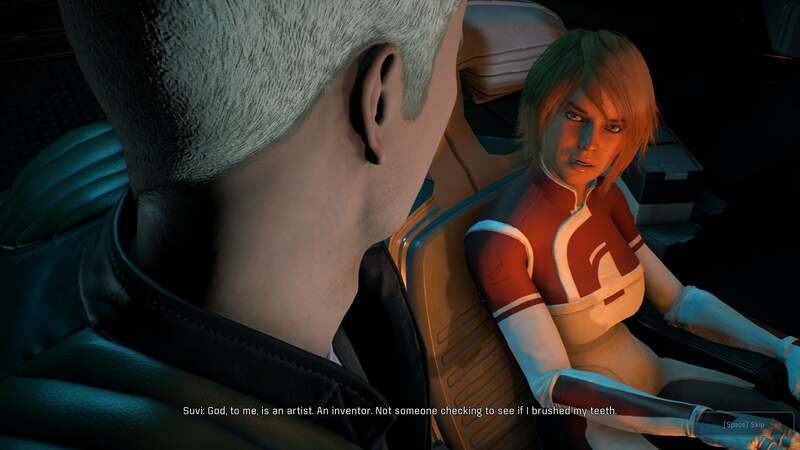 It even meant something in 2012, though BioWare botched it a bit with Mass Effect 3’s ending. It was only five years ago, but it’s been a lifetime for video games. Think about this: When Mass Effect 3 released in March of 2012, there was no “Telltale formula.” The first season of The Walking Dead didn’t release until April, a month after. There was also no Witcher 3 or Life is Strange, no Torment: Tides of Numenera or Banner Saga or Dishonored or Wolfenstein: The New Order or Event, 80 Days, Papers Please, Undertale, Gone Home, Shadow of Mordor, Never Alone, Quantum Break, Papo & Yo, or Sunless Sea. Not all of those games are perfect, and you don’t have to like every game on that list. Hell, I don’t like every game on that list. But the way we think about storytelling in video games has evolved, both in our idea of how to tell a story and what a story can be about. 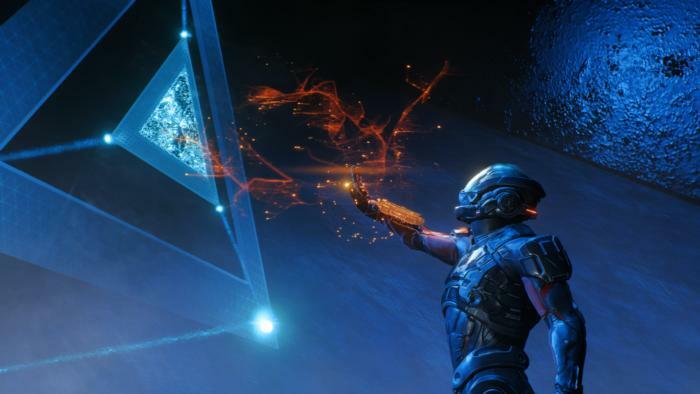 BioWare’s storytelling hasn’t evolved along with the rest. Oh, there’s more of it. You can drown in Andromeda’s quests if you’re not careful. Characters still conduct conversations like interrogations, though. 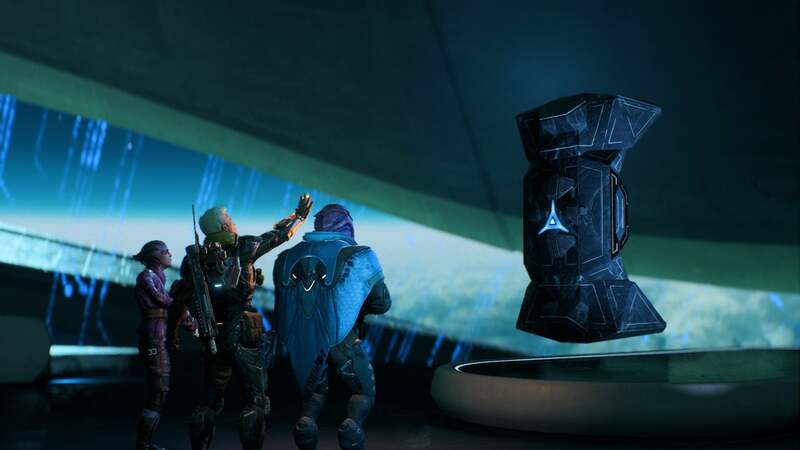 Quests hinge on binary this-or-that choices, with the outcomes often separated into an obvious Good bin and a Bad bin instead of shades of gray—and most of the choices are immediately discarded in Andromeda’s case anyway. Complicated plots are explained away with deus ex machina. Spectacle often substitutes in where subtlety would’ve suited better. 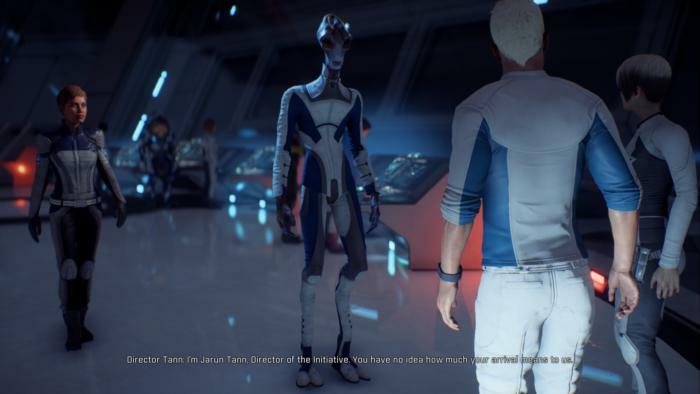 Even if you think Andromeda feels like the original Mass Effect, and I’m not convinced it does, that still neglects a decade’s worth of evolution—maybe the most important decade, as far as video game stories are concerned. 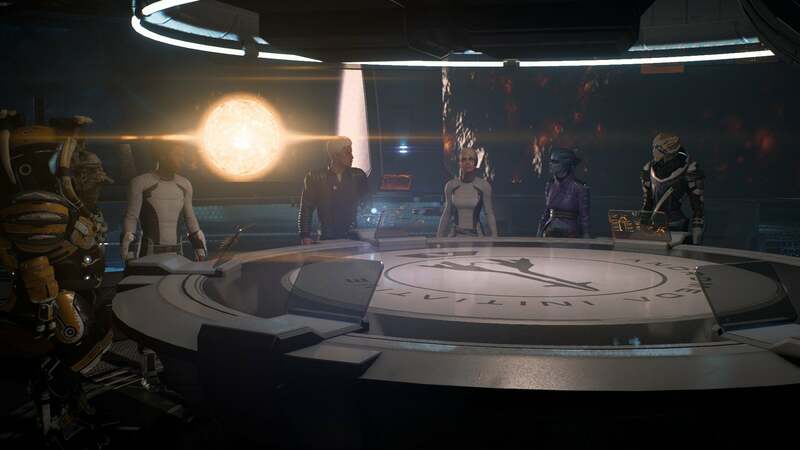 Andromeda feels archaic, bested by the very same companies that once lived in its shadow. 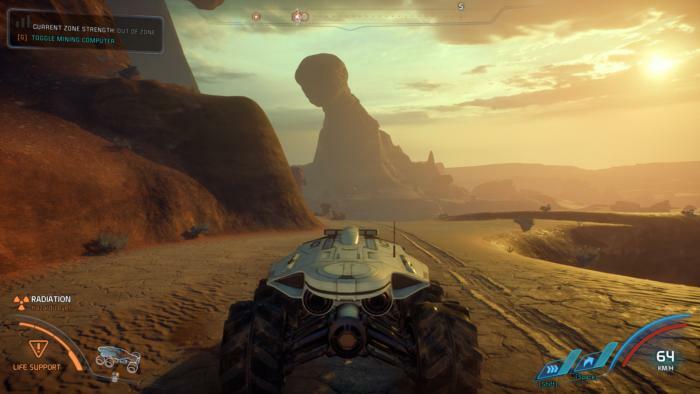 Mass Effect: Andromeda is eminently playable. I haven’t spent much time on some of the more positive aspects, because I don’t think they matter too much in the long run. Environments are beautiful, if generic. Combat is actually pretty great once you’ve deciphered the crafting and the overwrought leveling system. Andromeda goes down easy, and it’s a game you can mindlessly sink 50 to 100 hours into and be mildly entertained, same as (for instance) the latter-era Assassin’s Creeds. Occasionally it even scratches at something deeper. My point is: It’s mediocre, not awful. This review slants negative because I find the writing mostly bad, but my experience with Andromeda is almost worse in some ways: For much of my 55 hours with it, I felt nothing at all. It just exists, content to let you run from fetch quest to fetch quest, chasing the appearance of importance while saying nothing at all. It’d be easier to just condemn the whole endeavor and write it off, but that’s not entirely fair. I’m mostly ambivalent, or “I’m not mad, just disappointed,” as my parents might’ve said—and ouch, that always stung much worse. It’s the Hollywoodized reboot of that offbeat foreign film you loved, or the not-great-but-what-else-do-you-have adaptation of that book you cherish. That’s Mass Effect: Andromeda. What a letdown. Padded to twice as long as it needs to be, littered with meaningless missions and weak dialogue, Mass Effect: Andromeda takes a galaxy's worth of potential and squanders it.